Great running automobile. Quiet. Peppy when needed. Comfortable on long as well as short trips. All of the instrumentation takes time to get accustomed to, and can be somewhat intimidating to those of us who are electronically challenged. The manual must be consulted frequently. Gasoline mileage is adequate for the size of the car, but not outstanding. One should not purchase this SUV with the idea of saving money at the gas pump. Traded my 2011 Cadillac SRX Performance model Seats were to hard and harsh ride. Found seats and ride in Buick put Cadillac to shame. Much more solid on road. Handling is excellent. But for $53,000 list price. The cheap plastic decor inside this car makes it really look cheap and poor quality I am not sure I would purchase it again. My wife and I purchased this vehicle for our expanding family. 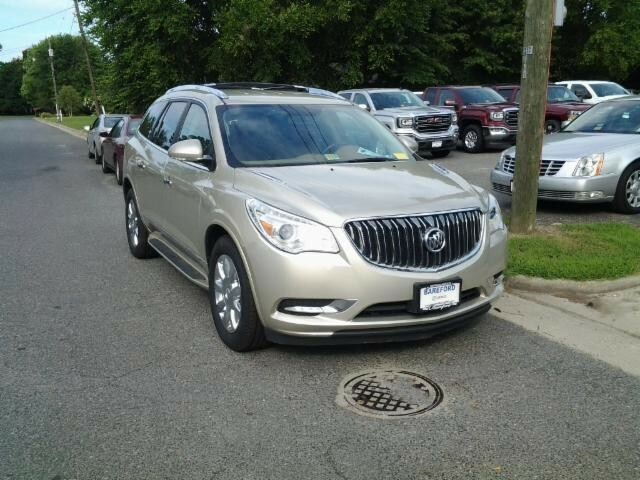 We went from a 2009 Rav4 to the 2013 Buick Enclave. Lots of space, comfy ride (we've made a few trips up and down the coast with no complaints), and runs smoothly. It is a bit hard to see out the back, but the camera more than makes up for it. Definitely our favorite feature. Two issues with the Enclave: the first is the head rest. For whatever reason, my neck is never comfortable regardless on how I position it. Also, it does not lock into place so whenever someone climbs in the back and grabs it, the headrest gets knocked out of position. The second is the NAV system. Definitely a complete waste of money. The car rides great, interiors really nice, I like the overall features. Have had the car since July(now Oct) and I am getting horrible gas mileage. With a City/Hwy combo every day to/from work I average 12 miles to the gallon. It is so sad to watch....and fill up the tank. The dealer advised to give it to 5K before engine is broken in, but I am not too optimistic - and may be looking to trade it in for that alone. 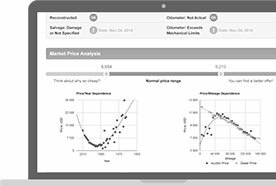 Update 4/10/16. Still nice car but gas mileage horrible in a real city, not suburb city where car manf measures gas mileage. V6 lacks power, especially on hilly terrain. Sunroof has leaked entire first year of ownership. Apparently Buick unwilling or unable to correct. And the dealer, Carl Black, did ZERO to accommodate. Traded the piece of crap in for a Ford after one year. This is truly a wonderful car and our first American car in many years. We have three children under 10 and this is by far the most roomy and classy ride that money can buy. It is a quient and very nicely appointed interior. Having the captains chairs was a must for us and this is the nicest car with that option. One complaint is the hazard button is way too sensitive. i hit that all the time when using the radio. Otherwise, love this car! I have had my Enclave for 3 years. It now has 29,000 miles on it and I have not had one problem with the car. I love it as much as I did in the beginning. 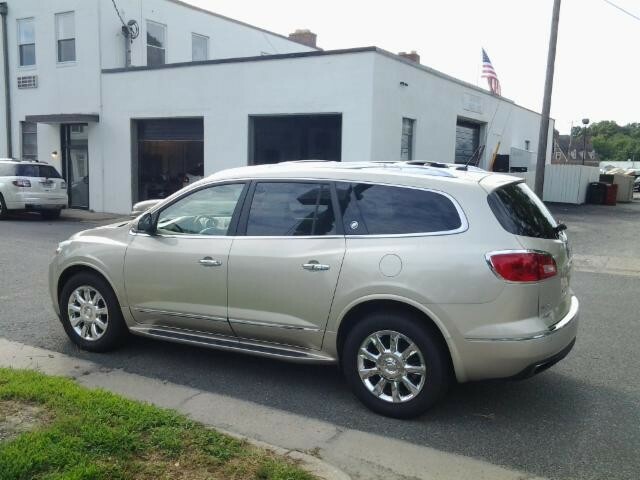 The Enclave is the perfect sized SUV for our family. The car is roomy inside, but easy to handle in tight parking lots. Great...but very frustrating navigation system. This car was primarily for my wife. She had been driving a Chevy Suburban. It was doing a fine job hauling our family around (three children and two large dogs) on vacation or around town. 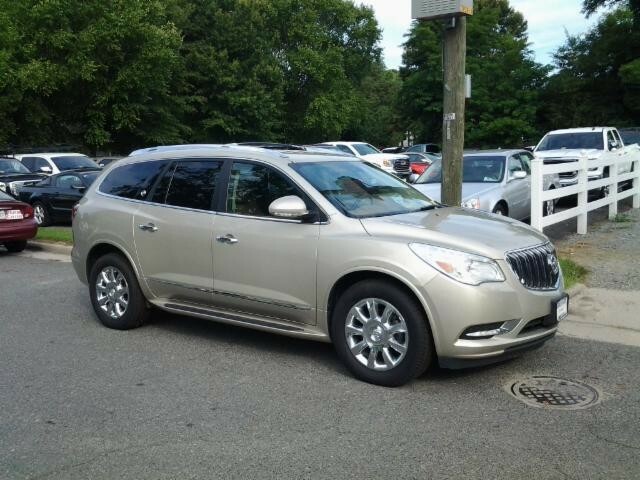 However, when it came time to replace the Suburban after 150+K miles, we switched to the Enclave. It's one of the finest SUV for the money. I highly recommend the Enclave, but the buyer should evaluate the touch screen and especially the Navigation system before they decide which vehicle to buy. My wife has no confidence in the Navigation system and often resorts to using her smart phone Maps App to find her way around. Good to see Buick being relevant! My wife and I were in search of a 7-passenger vehicle and searched high and low. In the end, the refreshed Enclave offered everything we were looking for. Have had our Enclave for 1 week and absolutely love everything about it. The interior is much more plush than the 2012 model. The quiet cabin is as advertised. The ride is so comfortable it is hard to describe. The led rope lighting on the doors and dash are classy. First time we got the articulating headlamps and this actually helps enlarge the area of lighting when turning. The rear entertainment system will be well used by grandkids. The Intellilink is user freindly and awesome. The spaciousness for all 7 seats is impressive. I'd like to congratulate the Buick team for bringing their product line out of the stone ages. I left this company for dead. I just bought a 2013 Enclave AWD, leather edition and all I can say is WOW. The fit & finish is right up there with Lexus or Mercedes. They didn't short cut as American manufacturers generally do. I can't believe that this car is even American built. The car handles great and the ride is smooth. I especially love the Nav/electronics of the vehicle and it seems that Buick is up to date with these features. The led rope lighting the circles around the top of the dash and front doors is a nice touch at night. We have been pleased with this car. My friend has an older one, and I am happy to have gotten the redesigned version shortly after it was introduced. The transmission has been re-tuned to shift at higher RPM's, producing brisk and smoother acceleration. I was only disappointed that the navigation system's font size is too small and cannot be adjusted. This could be a safety hazard, since the small font makes it hard to read. 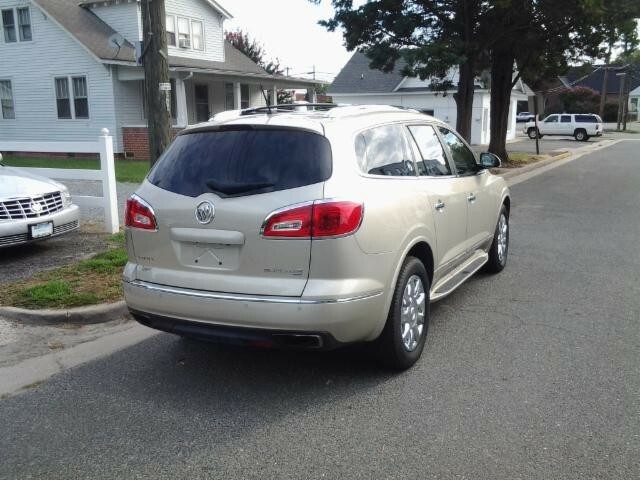 Back in 2008 the Buick Enclave was a work of art, a revolution in cross-over SUV vehicles. Unfortunately, I do not feel the same about the 2013 Enclave. Buick did add some features, but they also removed or downgraded some important things. The big selling point of this vehicle was supposed to be the Intellilink system with enhanced navigation, but then they made the touchscreen smaller than before? Other things like Pandora, Stitcher, Photoviewer simply do not work. Are they really selling a $50,000 vehicle that isn't even compatible with an iPhone? Are you kidding me? There is also an occastional low rumbling noise in the engine manifold when the vehicle is idling at a stoplight. 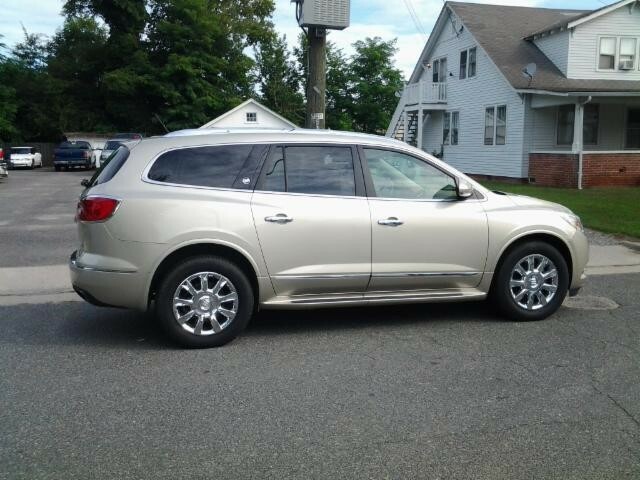 I just leased a 2013 Buick Enclave with Intellink. I had a 2010 Enclave and loved it. The Intellink is all touch buttons including the Emergency Flashers located just under the radio. When changing the radio I inadvertently touch the flasher button and turn them on . This happens daily. Fog lights are no longer available. I used them all the time. You better check with Buick to see which Smart Phones will work with Intellink. It cost me $600 to purchase a new phone when after several days and phones call I found out my HTC Rezound would not pair up. The Iphone 5 will not either. Surprise! Now that I bought a new phone Pandora still won't load.